The Gisborne Herald reported on 18 May 1952 that Gisborne had 13,000 cyclists out of a population of 20,000! We are a group of commuter cyclists interested in making it easier and safer for Gisborne residents to choose cycling for most of our trips within the city. We commend the Council for undertaking the development of a number of cycle-lanes on roads through the city. Experts predict that the price for a barrel of oil may be at US$100 per barrel by June of this year, with further rises up to $150 a barrel in the next five years and possibly up to $350/barrel by 2020. These changes will mean that even one car is considered a luxury. While cars are, and will be, important to the regional transport strategy (whatever they run on), Council should be considering public transport and alternative transport possibilities, and acting now to ensure they can be implemented when required in the future. We support the vision of a city linked by green corridors which connect the neighbourhoods of the city, and heritage/leisure destinations. 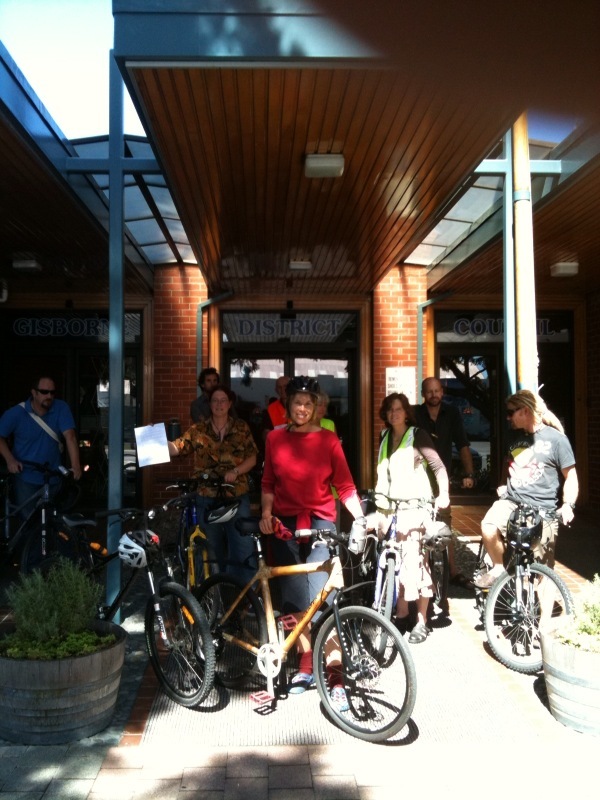 Gisborne is ideally suited for bicycles and walking and this should be encouraged as it is sustainable, good for health, and attractive for tourists and future residents. We support current efforts to educate and encourage all road users to share the road and to think of others safety at all times. The great cycling-centric cities of Europe have only been designed this way through the concerted and sustained efforts of the public, politicians, planners and engineers. With estimates of over 3,000 bicycle trips in Gisborne per day and roughly half of these are school students, we recommend Council monitor the number of cycles in school bike racks over a three year period and work with CAG to identify barriers to cycling and implement with community leadership, actions likely to increase the number, frequency and duration of student cycle trips. We draw attention to proposals for cycleway options on the Gladstone Road bridge and the possibility of a boardwalk cycle/walkway along the Taruheru River from Lytton Road to the CBD and request staff be directed to establish a cost estimate for both projects. We also ask for GDC to work with the Gisborne Cycling & Walkways Trust to make an approach to Eastland Community Trust and Eastern & Central Community Trust for funding to complete the Wainui-Sponge Bay cycleway. Given recent changes in central government policy on transport subsidies, it seems timely to undertake a review of the priorities of the Walking & Cycling Strategy and new sources of funding for major projects, we suggest this be included in the Annual work plan for GDC. Manu Caddie; Michelle Hight & Bradley O’Donnel; Gillian Ward; Richard Coates; Ross Revington; Sarah Cleave; Bob Hughes; Norman Weiss & Diana Whakapapa.